finished invites, originally uploaded by ordinarymoment. Here’s all the invites drying, just waiting to be sent. Though the process was indeed quite time-consuming and a little tedious, we knew when we finished that all our effort was worth it. They had just the organic, simple + handmade feel we were going for. 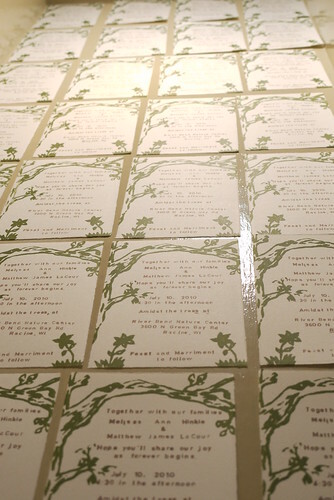 For the response cards, I made a linocut stamp with a larger leaf + branch design that tied in to the invite tree. Going along with the repurpose theme, I’ve been able to use the extra blank cards + printing supplies to make my own cards to give out throughout the year. We love feeling as if we didn’t let anything from our day go to waste. We just keep spreading the love all year long!